Dickey Lee, like so many country singers of the 1960s, came to Nashville after a career in pop and rock'n'roll music. He travelled a similar road as Conway Twitty and Jerry Lee Lewis, beginning his recording career in the mid-1950s at the legendary Sun Studios in Memphis. 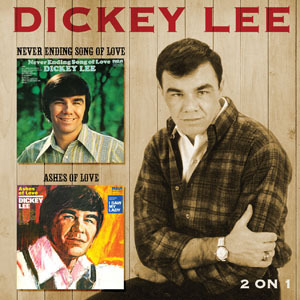 Throughout the 1970s Dickey Lee was a near fixture on the American country charts, chalking up an impressive 29 entries including the chart-topping Rocky and such top 10 hits as 9,999,999 Tears, Angels, Roses And Rain, Ashes of Love and Never Ending Song Of Love. He was inducted into the Nashville Songwriters Hall of Fame in 1995. Dickey Lee is the composer of the country classic, She Thinks I Still Care, (included here) which has been famously covered by George Jones, Elvis Presley, Connie Francis and many others. This CD features Dickey Lee's first two Country music LPs, which were originally released in 1971 and 1972 on the RCA label. The accompanying 8 page booklet includes full recording details and extensive liner notes.